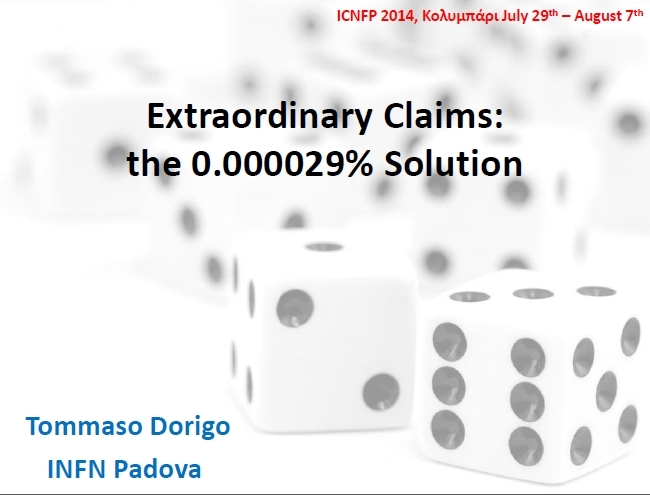 Yesterday I gave a lecture at the 3rd International Conference on New Frontiers in Physics, which is going on in kolympari (Crete). I spoke critically about the five-sigma criterion that is nowadays the accepted standard in particle physics and astrophysics for discovery claims. My slides, as usual, are quite heavily written, which is a nuisance if you are sitting at the conference trying to follow my speech, but it becomes an asset if you are reading them by yourself post-mortem. You can find them here (pdf) and here (ppt) . Here I cannot go into the details of the lecture, which lasted 45 minutes and went into quite a bit of detail of the history of the criterion to set the stage for a critical assessment of the few pros and the many cons of having a fixed, and totally arbitrary, threshold for the many searches for standard and non-standard signals, be them indicative of new physics or just confirmations of the standard model. Maybe it is more interesting if I mention here a funny exchange that occurred after my talk, when Eef van Beveren gave his own lecture on the existence of a superlight scalar at 38 MeV (among other things). 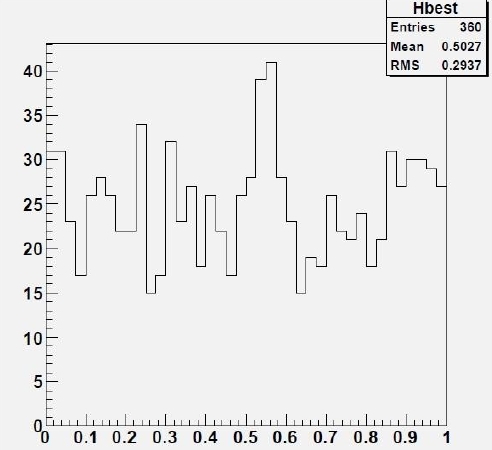 For instance, look at the "peak" in the histogram below. Would you be excited by seeing it when you expected a flat distribution ? The trick is that if you did not specify in advance the abscissa at which you expected a fluctuation, this may happen anywhere in the spectrum, boosting the significance of the local fluctuation. By reading the thread, I was reminded that two years ago I had offered a $1000 bet on the reality of that particle. As Eef appears still convinced that there is a particle there, I could point out in a comment after his talk that perhaps, in addition to the "five sigma" criterion for deciding whether a new signal can be trusted or not, one has an additional piece of evidence, more of Bayesian nature: you offer a wager, and if nobody takes it that is strong evidence that the claim is not believable! In the case of the 38 MeV diphoton resonance, I think the fact that nobody took my bet can be taken as a mild evidence that we should just move on... On the other hand I must say I sympathise with Eef and his attempts at getting experimental collaborations to consider the potential effect and prove or disprove it with their data. I think it's a shame that ATLAS and CMS, who have the data to do that, have not taken the time to do it.